In the final part of my Standard Pauper set review for Dragons of Tarkir, I listed 11 cards that I believed would make the biggest impact in the format. I thought it would be helpful to look back at these cards and compare my evaluations to how the metagame has turned out thus far. Last time, I discussed how 8 of my 11 picks were seeing consistent play. Today, I want to look at the other 3 cards and look at why I think they aren't seeing much play. So of these eleven, the current "stinkers" are Dromoka Dunecaster, Monastery Loremaster, and Student of Ojutai. Let's take a look at each of them. 1. In the past, White tappers such as Blinding Mage have traditionally been very good. As of late, Wizards has been making these more conditional, restricting the target by size or other characteristics, such as only non-flying creatures without flying, which is a fairly big restriction. Worse, having to pay two mana is surprisingly significant, choking the mana you have available each turn. But I think the biggest reason this isn't seeing much play is simply than the traditional White Weenie has been overshadowed by Boros Heroic, which plays a lot more combat tricks and protection rather than removal. 2. Both Mnemonic Wall and Archaeomancer saw quite a bit of play in previous formats, and Monastery Loremaster is arguably stronger than either of those cards. The flexibility of Megamorph shouldn't be overstated, giving you the ability to get it down early, then flip it over later and return a key spell back to your hand. However, with the Graveyard being used as a resource with Delve, it is much rarer to have desirable spells just sitting around waiting to be returned. At this point, it wouldn't surprise me if the presence of Treasure Cruise is sufficient to keep this from ever seeing play. 3. Student of Ojutai is probably also being pushed out of the metagame by the dominance of the Heroic decks, which aren't looking to go into the long game with defensive creatures and incidental Lifegain. Additionally, it doesn't quite fit in with a traditional White Weenie deck either, since those decks rarely play much in the way of spells. But a 2/4 for 3W that gives you 2 life whenever you cast a noncreature spell is quite good value for a Common, and once Heroic rotates out of Standard, I wouldn't be surprised if this found its way into a competitive deck. 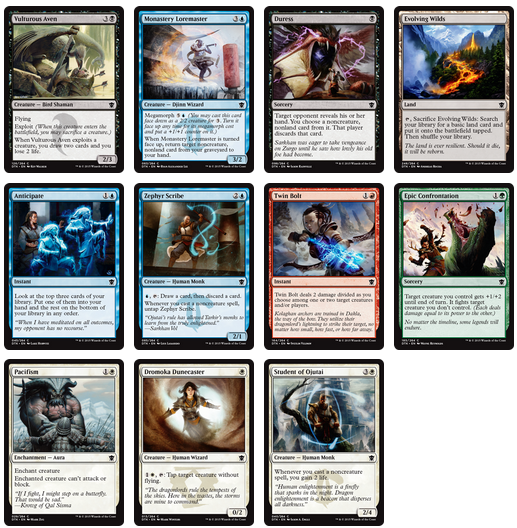 So that's where things stand with what I recognized as the top cards from Dragons of Tarkir. We still have quite a bit to go before Magic Origins is released, and I wouldn't be surprised to see more innovation prior to that release. Those cards may be deceptive. You made a good job with your predictions. I think Student of Ojutai is a good card and it can find a home in a Azorius Control deck (hell, I'm probably including it on my Esper deck today...early tests are promising). Tappers are really bad right now and this one is not better than Akron Mastiff, which sees zero play. The major problem with the Loremaster is the huge amount of mana you need to activate its ability. Your deck needs to be aimed to a ridiculously long game, it is much more restrictive than Archaeomancer and Mnemonic Wall. It is indeed more powerful than those cards, but it is not that easy to profit from it.